Dedicated to innovation, d.school Paris bases its pedagogy on design thinking, an approach with its origins and theoretical foundations at Stanford University in California. Dedicated to innovation, d.school Paris bases its pedagogy on design thinking, an approach with its origins and theoretical foundations at Stanford University in California. This concept is simultaneously a discipline, a process, and a culture, which combine to form a new way of designing products and services. Its purpose? To guide multidisciplinary teams in the creation of experiences through an in-depth exploration of what users really want, while taking into account technical and economic constraints. Students learn to innovate in teams through practice. The level is determined by the nature of the projects carried out, with or without a partner. 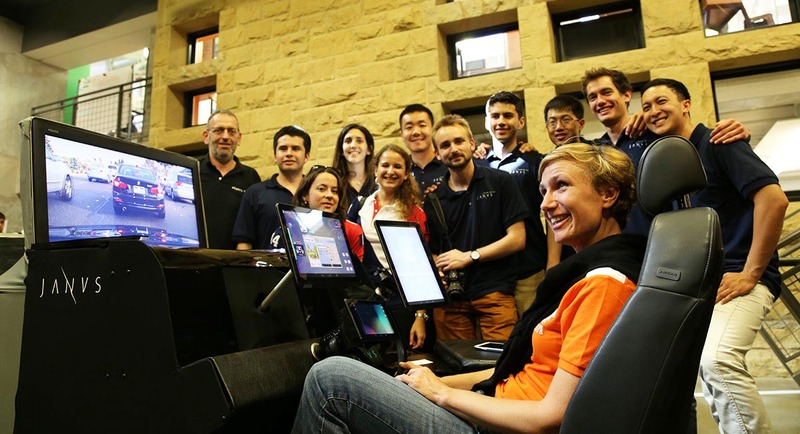 Project-classes are open to students from all disciplines, from all countries, and from all schools. Access to them depends on the pedagogical skills available, which are determined by the consortium professors. Inspiration/ideation/implementation are the exploratory activities within our iterative and cyclical process. Each course includes a practical production which creates value for a partner while reinventing an experience for the target users. To achieve this outcome, students learn by iterative practice at each stage of the process: listening, imagining, designing, producing. However straight you strike, you also need to strike hard to make a real impact. The goal is to create value, to have an impact, for users, for partners, for society. Depending on the course level, projects can be run in partnership with local structures, public authorities, or industrial firms. The aim is to gain a good understanding of the partner’s priorities and production capacities, to link them with the needs of future users. Engineers, designers, salespeople, architects, all disciplines are welcome at the d-school. Design thinking offers a shared language that transcends the different disciplines, allowing teams to analyze and resolve complex problems. The formation of the French d-school is part of an international movement, initiated by Hasso Platner and David Kelley at the University of Stanford in California and Potsdam in Germany, and picked up by the Design Factory initiative at Aalto University in Finland. Since 2013, our innovation school has been located in a brand-new building, called Coriolis, on the Cité Descartes campus. A positive energy building, Coriolis offers its students more than 300m² of spaces dedicated to innovation, a 450 seat lecture hall and a testing space measuring over 600m². Our partnership with the educational furniture manufacturers Steelcase gives us access to cutting-edge equipment. The studio loft offers specially designed spaces that create the best conditions for innovation, both functionally and emotionally. An initiation into design thinking, where students discover the principal tools of ethnographic research, the principles of prototyping, various methods of creativity, storytelling, the importance of appropriately designed workspaces. In this course, students are introduced to the knowledge, people skills and know-how necessary to the discipline, which will be developed in the second semester on the Innovacteurs program. 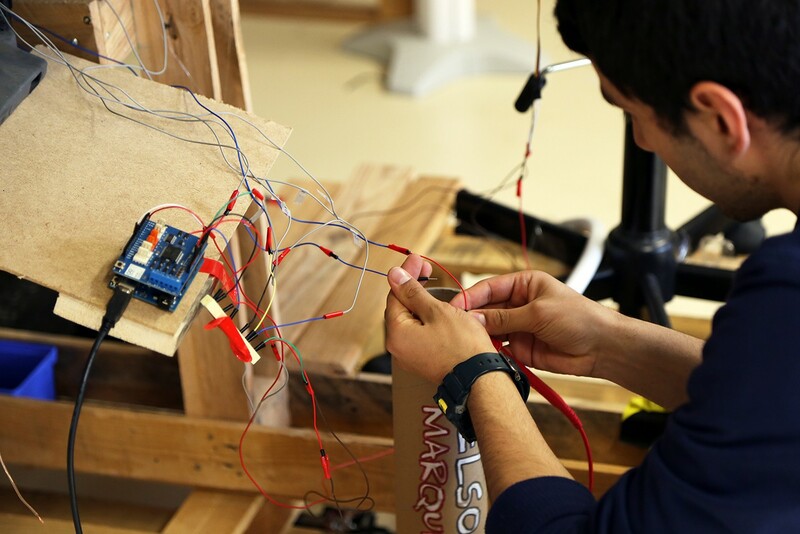 Students in the Industrial Engineering Department at École des Ponts ParisTech work in teams on a project brief provided by a company or organization, drawing on the knowledge acquired in the first semester course on design thinking to produce the prototype of an innovation. The program includes the possibility of social enterprise projects abroad. 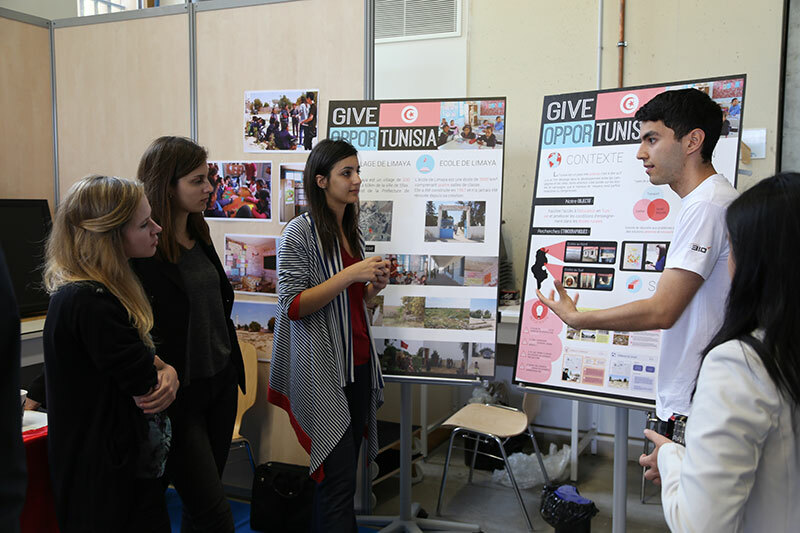 This program admits students from the four d.school Paris partner institutions (EAVT, EIVP, École des Ponts ParisTech, and ESIEE), teaching innovation through the discipline of Design Thinking applied to seniors. The seminar places students in the shoes of a designer developing innovations to tackle the problems affecting seniors. Creating a real impact is fundamental. For students at École des Ponts ParisTech, ESIEE, EAVT, and EIVP. 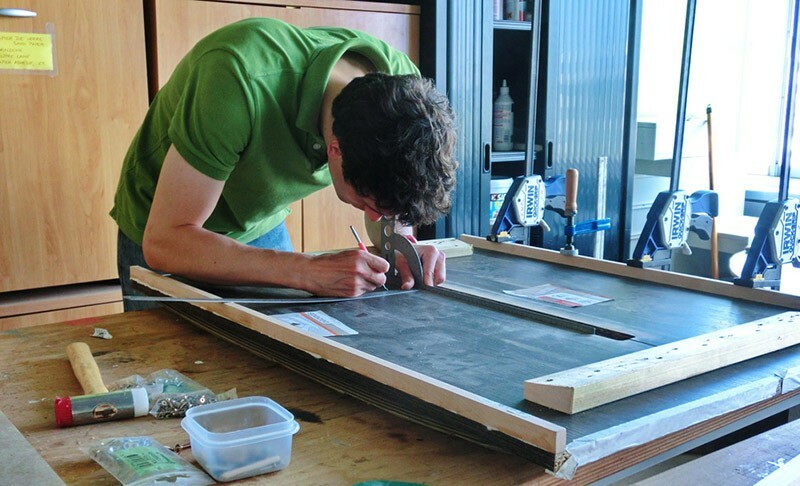 d.structure is aimed at students from EAVT and second-year students in the Civil Engineering Department at École des Ponts ParisTech. The aim of the course is to apply Design Thinking tools to the building of a structure on the campus. 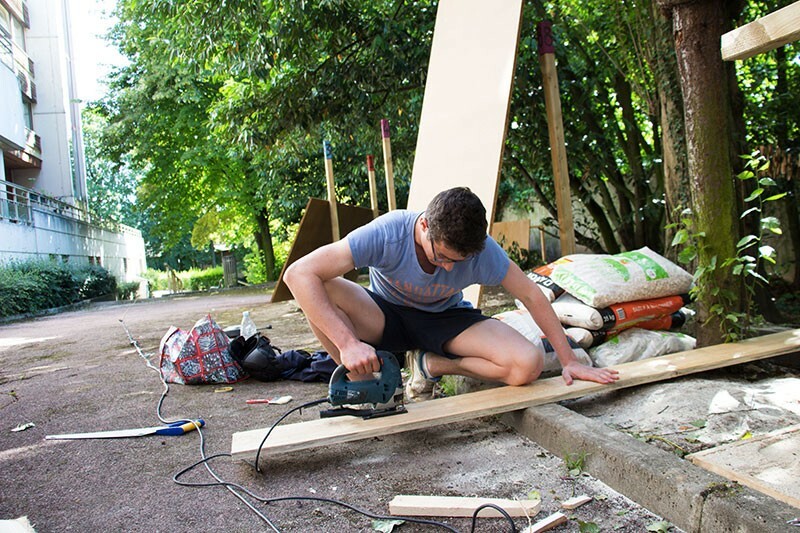 On the basis of user practices, students are asked to design and build a space for campus users: staff, students, visitors… After their ideas have been agreed with these users and the course supervisors, followed by structural calculation, the students must build the structure with a quantity of materials decided at the start of the project. The ME310 runs for one academic year full-time from October to the end of June. For one year, multidisciplinary teams use design thinking to work on an innovation brief provided by an industrial partner. They will tackle real-world conditions and users and discover how to make a real impact on them, in particular through the use of ethnography and prototyping tools. This program offers the opportunity to move off the drawing board and to make a real impact on big societal, industrial, and environmental issues. Each team is given a budget in order to conduct its exploratory and prototyping activities around the project, working in tandem with the industrial partner. The program includes two journeys of discovery and exploration to the d.school at Stanford University and San Francisco, to be immersed in the Silicon Valley mindset and to meet the academic partners.